KU’s Macromolecule and Vaccine Stabilization Center is recognized as a leading biotechnology center dedicated to research of virus-like particles and bacterial cells for pharmaceutical use. So when it was time to expand KU’s vaccine research, the university turned to William Picking, one of the nation’s foremost experts in virulence systems. The result? A Dream Team of vaccine development at the KU School of Pharmacy, already ranked #2 in the nation in National Institutes of Health funding. Picking joins KU as Foundation Distinguished Professor of Pharmaceutical Chemistry. 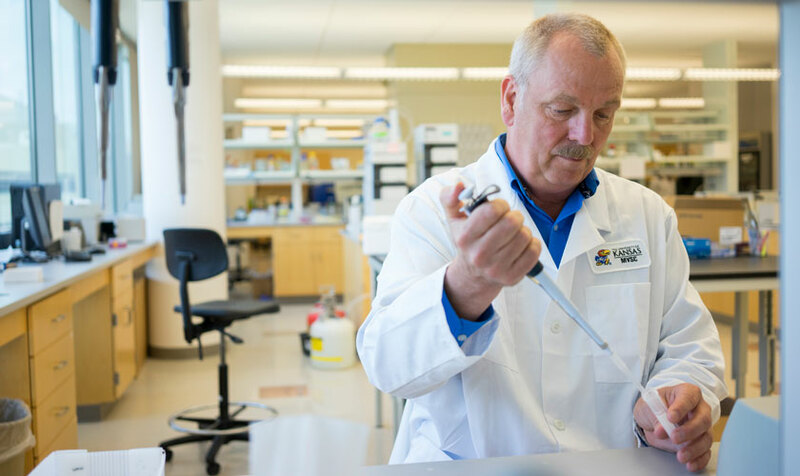 Regarded by his peers as one of the top researchers in his field, he will establish and direct the Kansas Vaccine Development Center. Among the first goals of the Kansas Vaccine Development Center will be developing specific vaccines for shigella, salmonella, and yersina — taking them from the laboratory to human clinical trials, and eventually to life-saving applications throughout the world. The Macromolecule and Vaccine Stabilization Center, directed by David Volkin and C. Russell Middaugh, each a Takeru and Aya Higuchi Distinguished Professor of Pharmaceutical Chemistry, has formulated more than 50 vaccine candidates, many of which are showing efficacy in clinical use. In the private sector, Volkin and Middaugh were involved in the creation of numerous vaccines that have saved the lives of millions of people and have a market value of several billion dollars per year.